When: February 16, 2019 - February 16, 2019 | 12:00 p.m. to 04:00 p.m.
At 12pm and 2pm. Planting your terrarium will take 30-45 min. 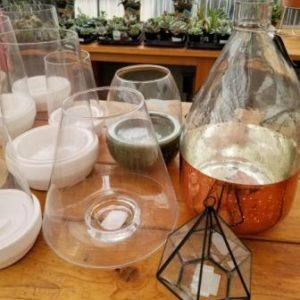 Purchase any terrarium planter and plant it for free. Terrarium prices $19.99-$59.99. Terrariums can be a beautiful addition to a table, desk, or counter top adding a decorative living accent to your indoor environment. In this workshop, we’ll teach you the mechanics of putting together your own living art piece and how to keep it healthy throughout the year. FREE materials include: 2” terrarium plants (quantity depends on the diameter of your container – see below), charcoal, soil, covering moss and gravel. Additional accents are available for purchase. While the cost of this class is free, we do require a reservation and a $5 deposit to hold your space for this event. Your $5 will be returned to you in the form of a credit which will be used towards the purchase of your terrarium. You may have 2 people making one item. You will be charged per item made not number of people attending. Kids 8 and older, welcome with an adult.